Chests were the earliest form of storage and could easily be carried from place to place. They were used for storing clothes, linen, documents or money and often had locks for security, as in this case. This example came from a farmhouse in Stamford, Lincolnshire. It is constructed of six boards, one for each of the sides, bottom and top. The lid is not original. Chest constructed of six boards, the front carved in low relief with three rows of ornament: arcading, with a scrolling band above and at the top cresting with rosettes. The ends are plain and divided into two feet at the bottom. The base of the chest is lifted well up of the ground on the side panels. The lid is not original. Given by Robert Mond, F.S.A., Combe Bank, Nr Sevenoaks. Said by the donor to have come from a farmhouse in the neighbourhood of Stamford, Lincolnshire, purchased 'a few months ago'. RP 1916/3067 (Nominal File MA/1/M2476) with the notation that the lid is not original. Symonds places this chest within a group of four, similarly decorated chests that he suggests were produced in the same workshop in the village of Watford, Northamptonshire, on the basis of similar construction and ornament and their provenance to the same area. A second is in a Northamptonshire church; a third, 'the Watford chest' (Portsmouth City Museums) formerly in the collection of Lord Henley and thought to have originated in Watford; a fourth (private collection), said to have been purchased in the 1950s from a farm at Whilton (Northants), sold 1998. Other comparable chests: (5) sold Gorringes, 25th April 2001, lot 1180 'estate of Dennis Ward'; (6) sold Sotheby's London sale L01712, 27/11/2001, lot 30 'the Peter Gwynn Collection'; (7) sold Christie's London, 21/11/1968 lot 89, illustrated in WINDISCH-GRAETZ, Franz: Möbel Europa. 1. Romantic-Gotik. (Munich, 1982)., fig. 165. 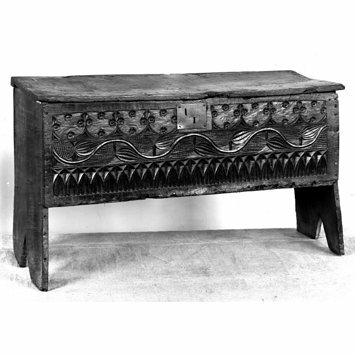 Symonds suggests that the Northampton church chest is the earliest, dating to the early 16th century. Charles Tracy, English Medieval Furniture and Woodwork (London, 1988), cat. no.304. 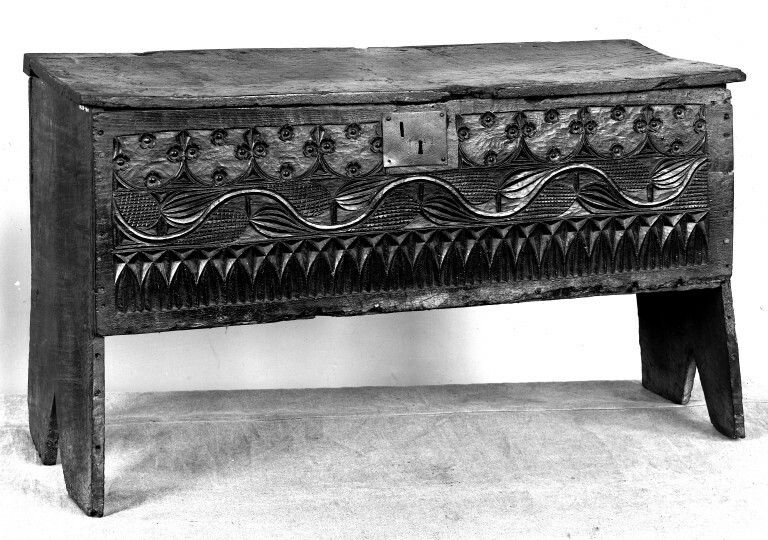 'CHEST, constructed of six boards; the front is carved with three rows of ornament; below is an arcading, above it a scrolling band with conventional leaves, and on the top a cresting with rosettes; the ends are plain and have pointed openings below. The lid is not the original one (PL.110). Given By Mr Robert L. Maud, F.S.A. From a farmhouse in the neighbourhood of Stamford,Lincolnshire. The decoration on the front panel is close to that on another early sixteenth- century chest sold at auction by Christie’s in 1968 (See F. Windisch-Graetz, Mohel Europas, Munich, 1982, p.225)'. See V. Chinnery, Oak Furniture: The British Tradition, (Antique Collector's Club, 1979), p 179 for similar chest. CESCINSKY, Herbert: The Gentle Art of Faking Furniture. (London, 1931). Pl. 39. Smith, H. Clifford, Catalogue of English Furniture & Woodwork. Vol II - Late Tudor and Early Stuart (London 1929). 'CHEST, constructed of six boards; the front is carved with three rows of ornament; below is an arcading, above it a scrolling band with conventional leaves, and on the top a cresting with rosettes; the ends are plain and have pointed openings below. The lid is not the original one. From a farmhouse in the neighbourhood of Stamford, Lincolnshire. Early 16th century.’ Plate 46, number 314. From the neighbourhood of Stamford, Lincolnshire. The lid is a replacement. Given by Mr, Robert Mond, F.S.A.